My fashion career actually began at the tender age of five. Knowing instinctively—no one had taught me this—that knee socks looked proportionately much better on me than the ankle-sock silhouette. My kindergarten wardrobe was limited but absolutely controlled by my perception of what worked. As the years went by, these types of sartorial convictions (proportion, mono color, fabrications) positively served as statements of my individuality and personal style. Today, I like to think that my career is a combination of my life's favorite experiences—my mother and grandmother's style, my quintessential "Southern California girl" upbringing during the most inspiring of decades—the 1960's and 70's. And, twenty nine years of working with the finest Italian and European fashion agents this side of New York influenced greatly my knowledge and passion for well designed and inspiring creations. Knitwear in particular is my favorite category of dressing so my merchandise reflects this softer silhouette. The marriage of fine Italian clothing with a soulful California attitude could not provide a better foundation for luxurious everyday style. My boutique is a space where I can interpret for myself and others just how to wear bias cut column dresses, cashmere wraps, retro jumpsuits or a leather jacket and boots. One of a kind couture items that most find just suitable for the "window" invites me to play with fashion—to appreciate beautiful things, to keep my interest piqued and my love for the industry constant. 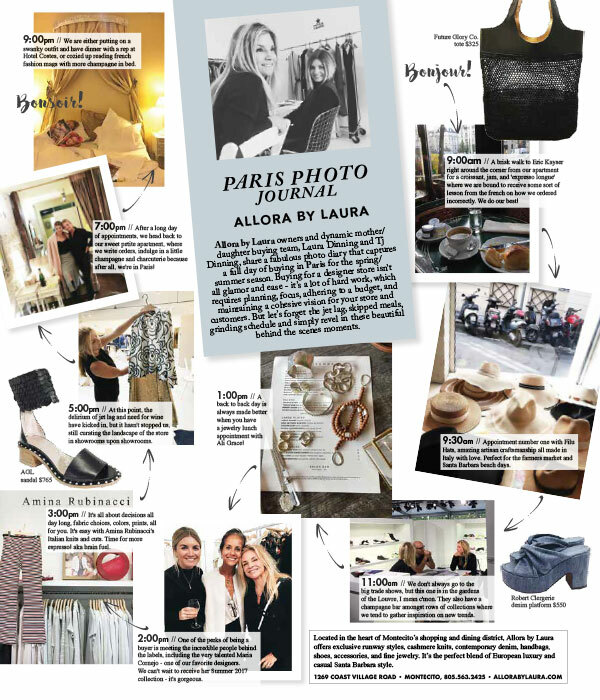 My boutique—Allora by Laura, is a culmination of all of this and more. It is my dream of self expression and a venue for assembling captivating attire. I am blessed with an awesome opportunity to delight and inspire and excite every person who comes to see what's new and fun and wonderful to wear.